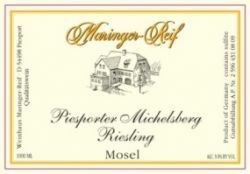 Maringer-Reif Piesporter Michelsberg 2014 (liter) is 100 percent Riesling. Maringer-Reif, of the village of Piesport, produces some of Germany’s finest Rieslings. Celler Master Jorg Matheus, Geisenhim graduate, part of a 400 year family history of producing wines, assures the exceptional quality of every bottle, every glass. Wines are produced using slow fermentation methods, stainless steel tanks, from grapes hand picked from low yield vineyards. All grapes are grown in Devonian slate. This region of the Middle Mosel has been a center of wine production since early Roman times. The famous Piesporter vineyards, Goldtropfchen, Treppchen, Michelsberg along with Dhroner Hofberger and Wintricher Ohligsberg produce wines of breathtaking complexity. Maringer-Reif was established in 1990, bought by the Matheus family in 2009.